Coulee Progressives: We need a candidate! Due to a vacancy, the City of La Crosse is accepting applications for candidates for the 5th District Council Member position. A candidate will be appointed by the Common Council on March 8, 2018, for the period ending April 16, 2019. Anyone appointed to fill the vacancy in the 5th District must be a qualified elector of the district at the time of the appointment. Persons interested in serving as Council Member for the 5th District should send a letter of application stating their desire and qualifications to the City Clerk’s Office, 400 La Crosse Street, La Crosse, Wisconsin 54601. Applications will be accepted until 5:00 p.m. Friday, February 16, 2018. This notice is pursuant to Wisconsin State Statutes, sec. 17.23, and at the direction of Council President Martin Gaul. 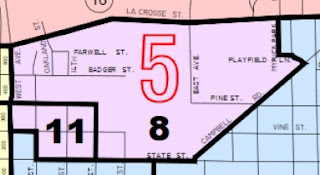 The Fifth District is the UWL district bordered by La Crosse Street on the north, West Ave, State Street (roughly - there are a couple of jogs here and there), then Campbell Road to that little road that takes you by the old tennis courts (in other words another little jog). See the map. This is a great opportunity!